First Flight Prep: Elevator balancing. Van's suggests balancing the elevators separately. 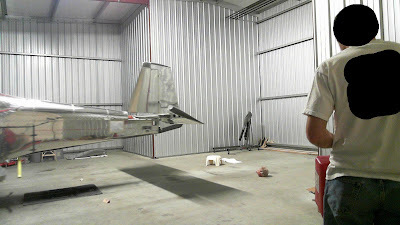 Because my aircraft is not yet painted, my plan was to balance them slightly heavy. My right elevator was too heavy and needed a few holes drilled in its weight to bring it more into balance. Oddly, my left elevator was too light. Here's the only picture I had showing how it likes to rest with the forward edge high. Thus, it required additional weight. That weight needs to be as far forward as possible to reduce how heavy it needs to be, thus I aimed for it to be a long, narrow piece. But it also needs to be wide enough to accommodate a #10 screw. Using a bag of hardware as a test weight, I was able to determine I needed about 7 - 8 ounces more weight. I decided to drill out the CS4-4 rivets holding the E-912 Elevator Tip Fairing so that I could add a nutplate just aft of the stock weights. Then I purchased an "electric ladle" made for melting and pouring lead (the melting point of Pb is 621.5°F). 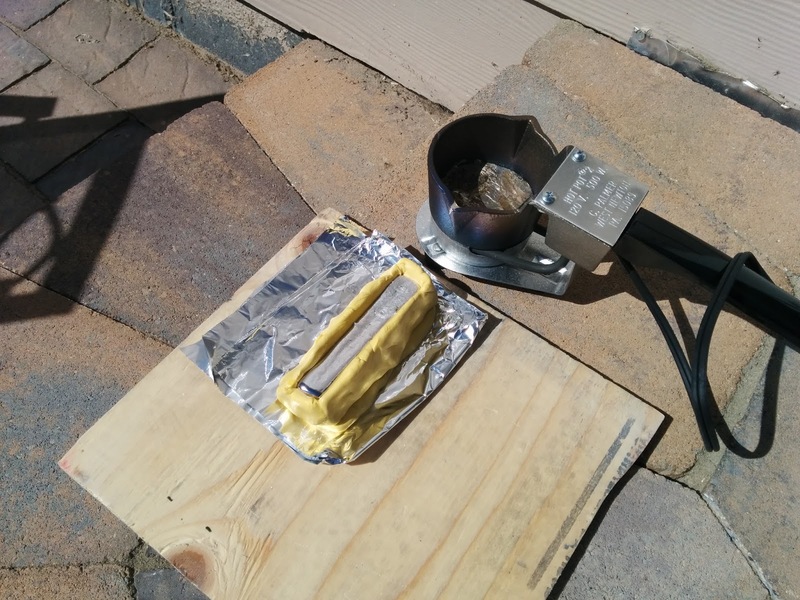 Both the collected swarf from what was drilled out of the right elevator, plus a 12 oz sinker (also obtainable from an outdoor store) supplied the lead I would need to melt and mold a weight. 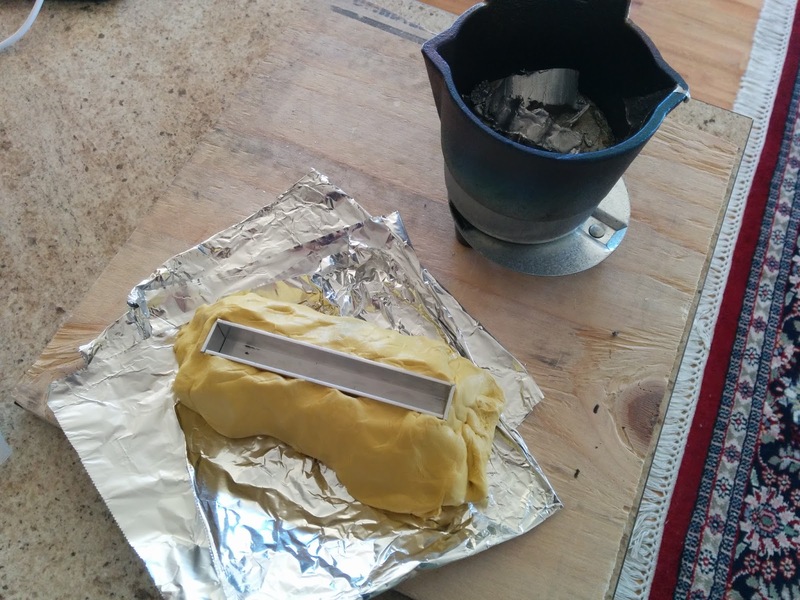 Originally, I purchased mold putty to make the mold. 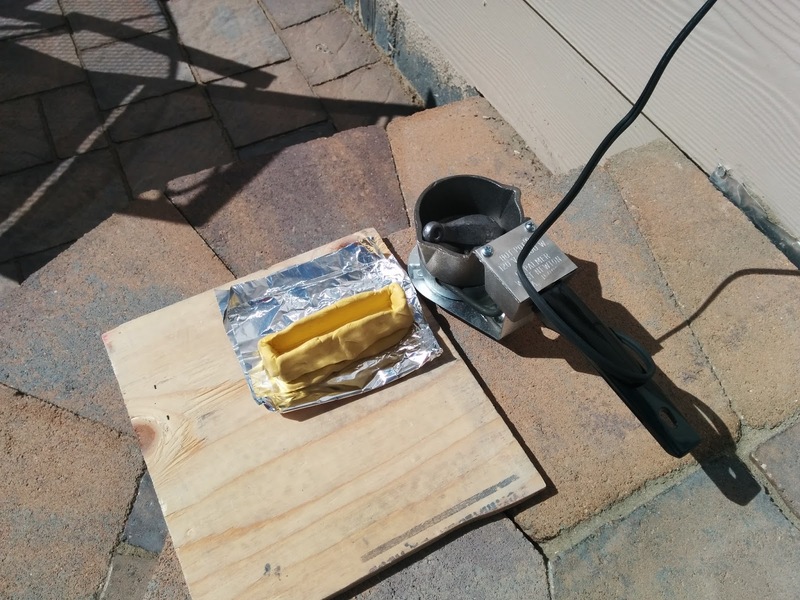 However, using that putty, I found my first pour was not flat enough on two sides (which is necessary to rest up against both the web of the E-903 Elevator Tip Rib and the E-614 Counterweight already in place). 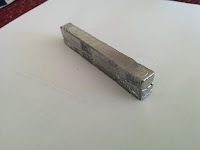 Next I used aluminum angles to re-mold the lead with 3 flat sides. 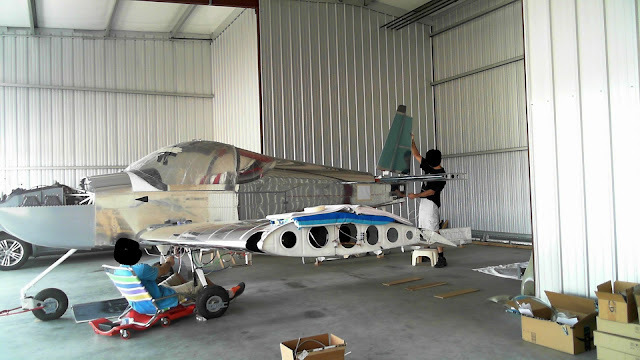 The mold putty was used to keep the four aluminum angles comprising the mold together. But I found that the weight from this second melt, though it looked good, wasn't quite the right shape. It was too long and narrow. Finally, on my third melt, not using the mold putty but instead just using aluminum angles backed up by bucking bars (to serve both as large heatsinks and to keep my "mold" from moving), I got it right. This additional weight contains about 7 ounces. First Flight Prep: First Engine Start. 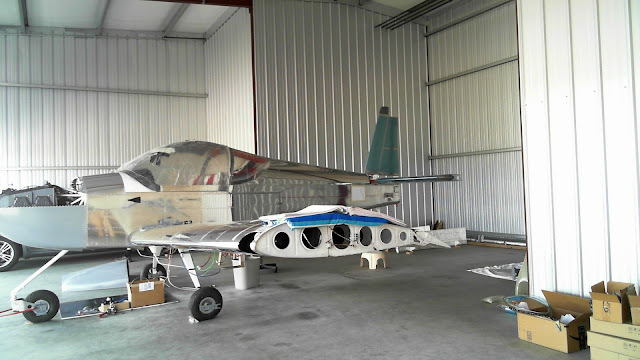 It has been quite a week after moving into the hangar over two days. Because I wanted to minimize the time building the plane in the hangar, the plan was to have nearly everything done at home prior to moving it there. Then, only the wings and tail would need to be attached. Thus, with confidence that everything was buttoned up and ready for an engine test, it was time. The left tank was dry (because of a leak) and the right tank had 25.4 gallons. If there ever is a next time, I don't think it's too intelligent to do a first start with a full tank. Oh well. 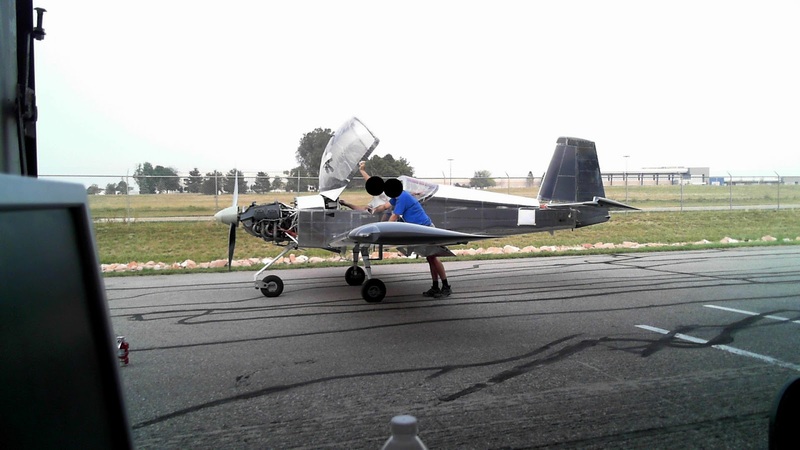 Here is my friend positioning the airplane into the wind. The bird is ready for first start. Though we checked the brakes prior to starting the engine, we really should have chocked the wheels. I stayed outside with the fire extinguisher at-the-ready, whilst my friend sat in the left seat. 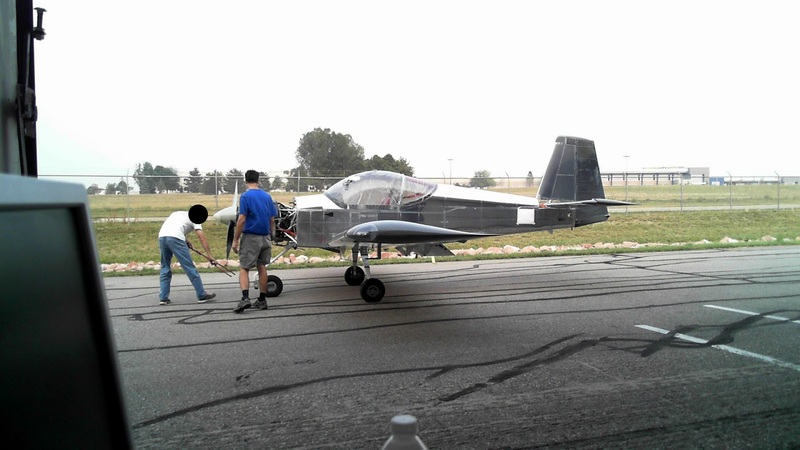 Though his RV-9A flies with a GRT EFIS too, he's not completely familiar with my panel (and heck, neither am I). Here I am going over it with him. A 34 second video of engine start. The fuel pump ran for 4 seconds prior to priming the engine. The engine cranked for 10 seconds (the max permitted on the starter) before it came to life. We ran it for just under a minute and turned it off because the oil pressure was showing 150 PSI (Update 9-Sep-17: I found the problem and described it in this post). Though I'm confident that's an incorrect reading and is probably a simple fix, it was the prudent decision. All other indicators looked good (EGT, CHT, oil temp, MAP, fuel pressure, etc.). The video fades into when the engine was shut down. My friend exits the aircraft as I check the engine, fire extinguisher in hand. The propeller had some oil slung on it from the hub. This is normal for the first twirl of a prop. Apologies for the poor image. I'll try to replace it with a better one shortly. The bird returns to its nest. There are a few more little items that need to be taken care of prior to requesting an inspection. That should happen in the next few months, when I have time. I don't want to set up an inspection and then have a deadline to meet. I'd rather it be ready, on my own time, then schedule the inspection. I'm not certain that I'll have too many more postings prior to inspection. I do want to post some info on my landing light installation and provide examples of the extent of the lights' illumination ability. They are AveoMaxx Hercules 30 landing lights (specs.and wiring). That will be forthcoming. First Flight Prep: First Tank Filling. My airport can be fairly busy during the day and it does not offer self serve fueling. So we decided to fuel up for the first time in the middle of the night. This way the lineperson could spend 30 minutes with us whilst I calibrated my tanks, without holding anyone else up. Here is the airplane, essentially fully assembled, leaving the hangar for the first time, in anticipation of getting "go juice". After $254.74 (ouch! ), here are my fueling results. I had the EIS on forward sensing yet it needed to be on reverse, so I'll need to either compensate for that or fuel up again. Also, I will need to measure when the optical sensors trip, so I'm leaving that blank for now. Sadly, the left tank was leaking about a drip per second. This came as a surprise to me as the tanks were successfully leak tested. It looked as though only the VA-261 Fuel Strainer fitting was leaking. But with the tank on, we just could not be sure of the source. So, after making an emergency visit to a store at 2:30 AM to buy four more 5 gallon gas containers, we salvaged nearly 25 gallons of fuel from the left tank. The next day, following 4 hours of sleep, we dropped the left tank. Then we filled it up with a gallon-ish of fuel, flipped it over and searched for the leak. Indeed, it was the Fuel Strainer fitting. That's an easy fix. 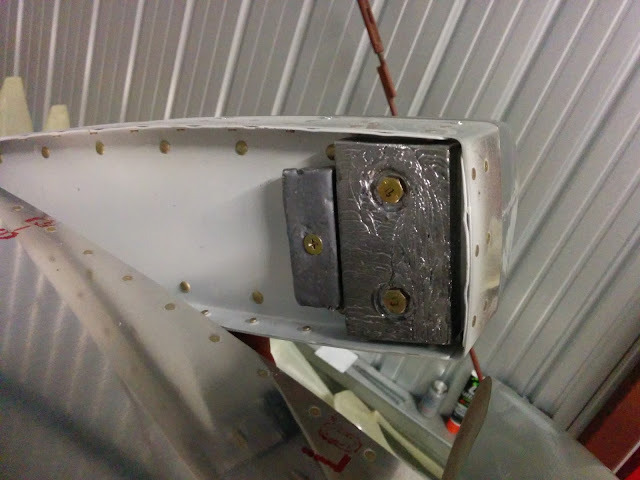 However, we also noticed a small blue stain on the wing spar about 2 inches outboard of where the third-from-inboard tank rib would be located (somehow, I deleted that image). This suggested that the baffle was leaking in that area. However, there was no evidence of a baffle leak, by way of any blue staining, on the tank itself (other than at the fitting previously described). And, the tank was not leaking in that area when filled with fuel and placed upside down. Yet, the tank could hold air! Utterly flummoxed, I decided to mix up some sealant and go over the Tank Attach Zee and baffle rivets in that area, just to be sure. The left tank was then drained again and resintalled. Here I am torquing the bolts. 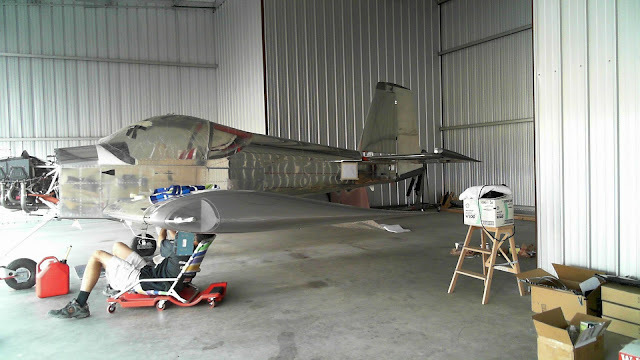 I'll know in two weeks, after the sealant cures and I can put some fuel in that left tank, if the leaks were addressed. 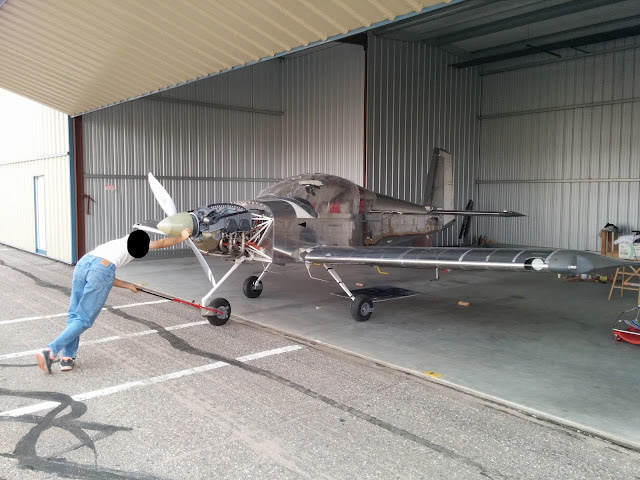 First Flight Prep: Weight and Balance. With the airplane fully assembled, measuring weight and balance was next. I obtained three of these 660 lb scales, model PCR-3315. They can be found cheaper elsewhere. It's important not to lift the airplane up then place it on the scales. This is because the main gear wheels would then place a lateral force on the scales, skewing the results (not just the scales!). So we first lifted the main wheels up onto blocks that were the same height as the scales. 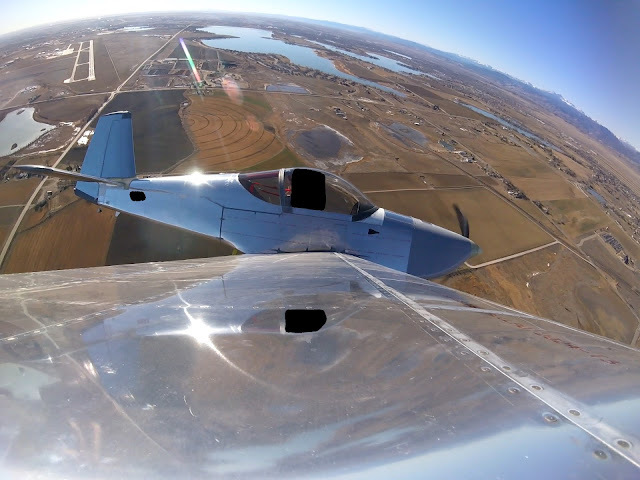 This was easily accomplished by my friend laying on his back and lifting each main wheel with his legs on the wing spar. I then slipped the wood blocks under each wheel, slightly off-center so that the wheel could slip into place when it bore weight. Here is the left wheel on the block, chocked. Next, we put the right wheel on the block, pushed the plane onto the two scales for the mains, then used the engine crane to lift the nose wheel onto its scale. Following that, all of the fairings were mounted with the screws. Headsets, carpets and seats remained in the aircraft. The engine was full with oil whilst the tanks were dry. Below are the results, using the arm lengths from the demonstrator (I will update this table whence I measure the arms for my aircraft). 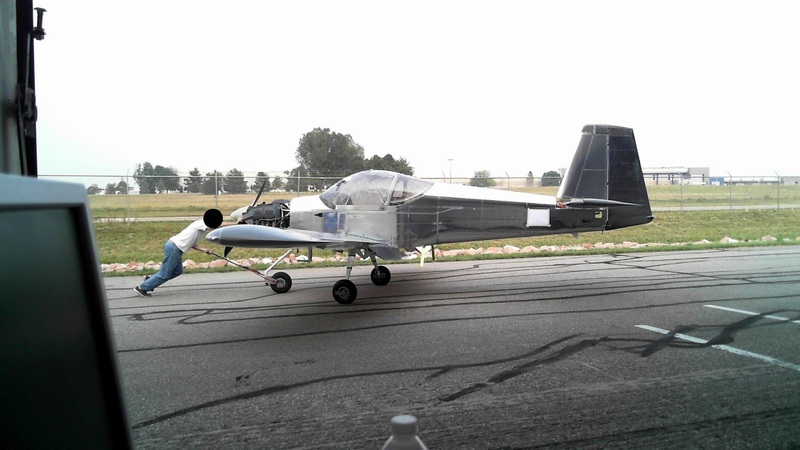 I expected that my airplane would probably be the heaviest RV-14A of the fleet. I believe I am correct. 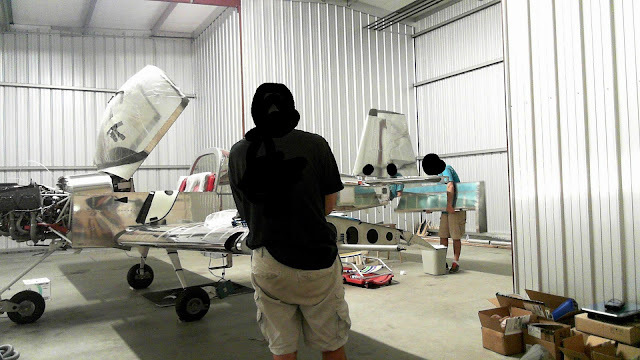 This is because my panel is elaborate (weighing nearly 30 pounds), as well as nearly all of the interior aluminum (except for the rudder and fuel tanks) is primed. I will verify the accuracy, as best I can, of the scales. You can find my W&B spreadsheet on my POH and checklists page. 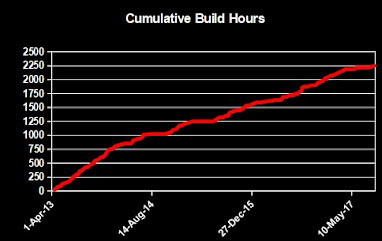 As a comparison, I searched for others' results using VAF as well as asking other builders. 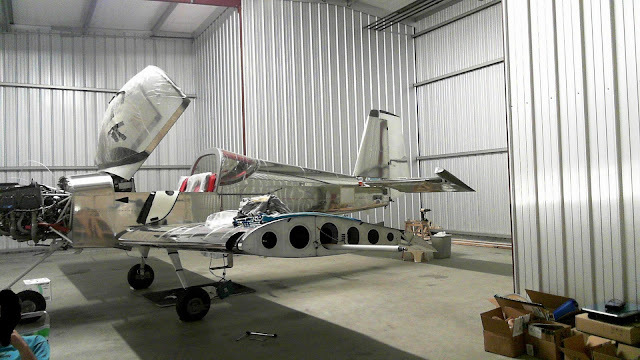 E RV-14A 1,312 81.4 Unpainted. Primed. N14YT Tim Olson RV-14A 1,309 81.13 Painted. Primed. VH-XIV Alan Carlisle RV-14A 1,289 80.9 Painted. Cliff RV-14A 1,280 82.29 Unpainted. XP-400, EFII, second battery. N626KM Bob Meyer RV-14A 1,262 80.3 No fairings, paint. Two batteries & alternators. N947RV Carl and Rafael RV-14A 1,255 80.24 Unpainted. 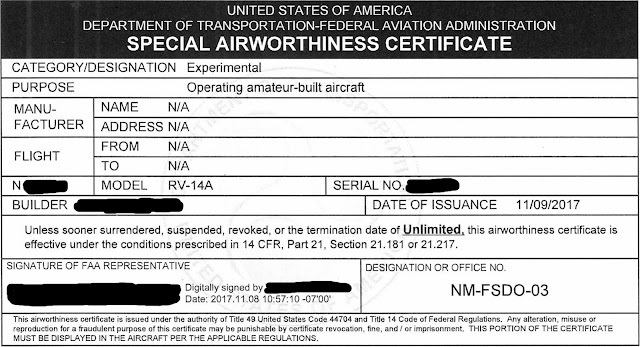 TJ RV-14A 1,247 79.94 Unpainted. N914VA Van's RV-14 1,246 81.38 Painted. N214VA Van's RV-14A 1,237 80.67 Painted. 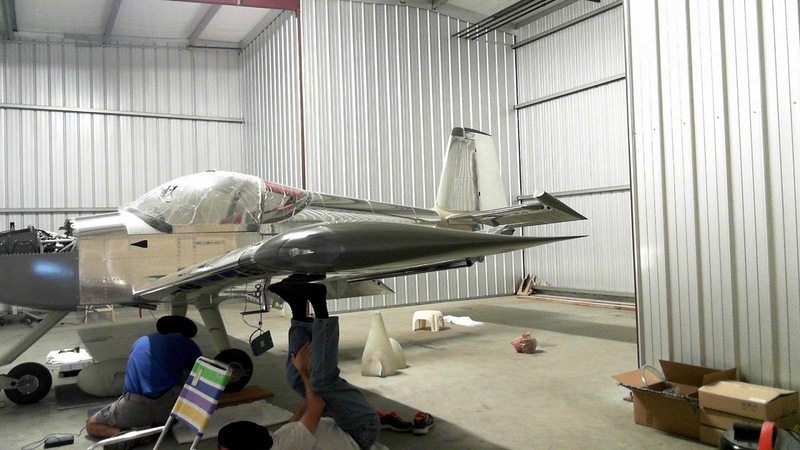 N214SW Stoney Ware RV-14 1,230 80.54 Unpainted. However, my fat plane's weight doesn't concern me. I'm a firm believer that the best way to manage aircraft weight is for the pilot to manage his/her weight! The empennage was originally attached back in November of 2016. However, that was in the garage and was done to complete the aft fairings. 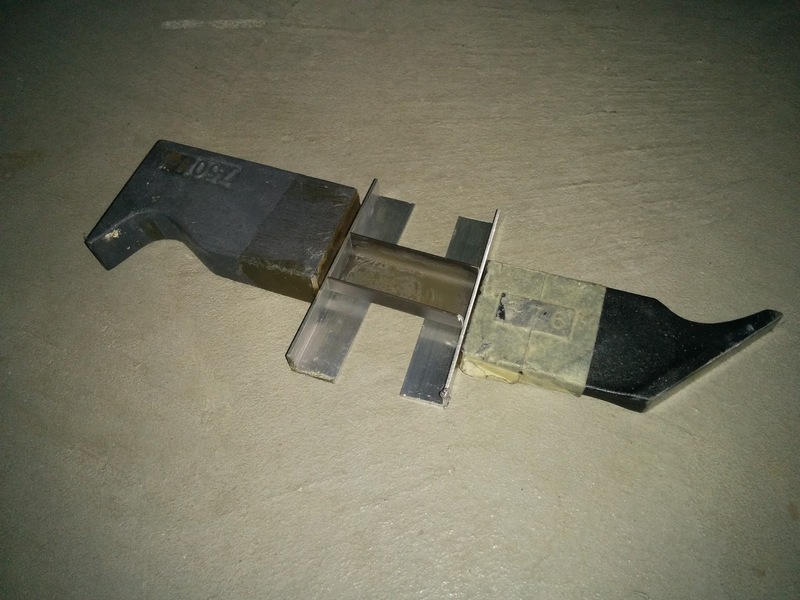 So the empennage was removed following completion of those items. 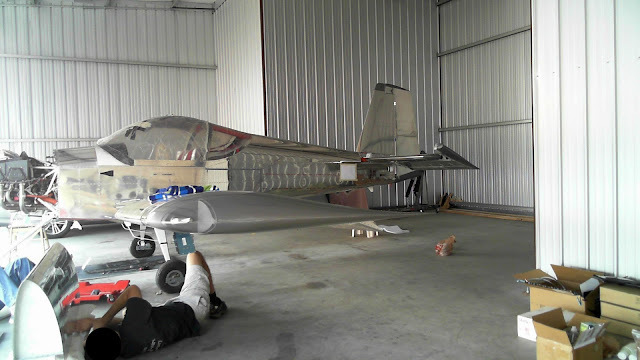 Now that the airplane lives in its hangar, it was time to reattach, permanently, the tail feathers. First the horizontal stabilizer is attached. Also, you can see my friend is working on torquing the wings after attachment. Next comes vertical stabilizer placement. 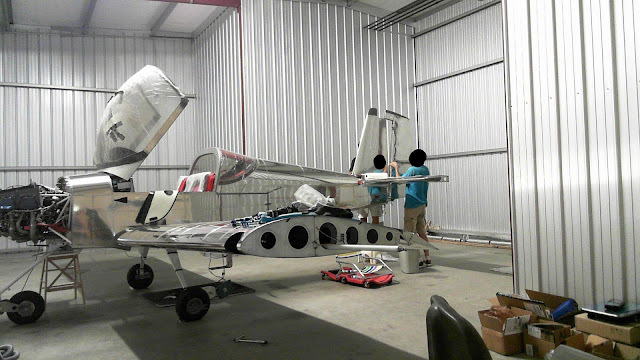 Here we are aligning the rudder for attachment. Torquing the bolts into the rod end bearings. And finally elevator placement. My friend placing the left elevator whilst I provide managerial guidance from a comfortable distance. Tail feathers attached. The rudder just needs its bottom fairing.